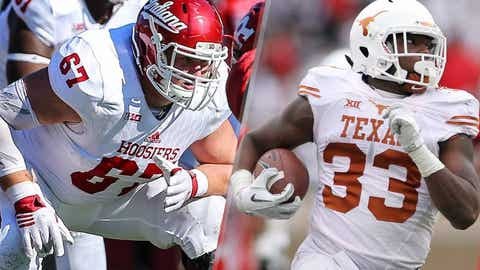 Dan Feeney and D'Onta Foreman are considered a pair of likely picks for the Minnesota Vikings in the upcoming NFL Draft. With the NFL season finally coming to a close it is time to turn the page to 2017. Which, of course, means to start looking at this year’s draft. The draft is still a couple of months away (April 27-29) but with the college football all-star games (i.e. East-West Shrine Game and Senior Bowl) now behind us, a little more evaluation has been done on players. Yes, there is still the combine. And players will be salary-cap casualties. Free agency is still a month away as well. But this felt as good a time as any to start looking at who the prognosticators think the Minnesota Vikings will select in the NFL Draft. For this purpose, we used only mocks which came out after the Senior Bowl. Of course, as it stands right now, the draft might not be as exciting for the Vikings, who currently do not own a first-round pick (if you somehow have forgotten, Minnesota dealt that pick to Philadelphia for quarterback Sam Bradford). Beyond any potential dip in enthusiasm for the draft, having no first-round pick also makes it a tad more difficult to find mock drafts which include the Vikings, as most mocks just include a first round. However, there are a few sites which mock multiple rounds (thank goodness), so we are able to offer up something. There’s no consensus on what position Minnesota might target with its first pick, although offensive line seems to be a popular choice. We’ll continue to provide mock draft roundup updates sporadically leading up to the draft. Walter Cherepinsky of WalterFootball.com (Feb. 7): Round 2 — Taylor Moton, OT, Western Michigan; Round 3a — Nazir Jones, DL, North Carolina; Round 3b — Ethan Pocic, G/C, LSU; Round 4a — ArDarius Stewart, WR, Alabama; Round 4b — Tyler Orlosky, C, West Virginia. Dan Kadar of SB Nation/Mocking the Draft (Feb. 6): Round 2 — Adam Bisnowaty, OT, Pittsburgh. “The Vikings haven’t been able to find consistency at left tackle, and that’s what a four-year starter like Bisnowaty can provide. He can struggle against speed rushers at times, but the hope would be that he can be coached up in that area and let his excellent technique take over.”; Round 3a — Jarron Jones, DT, Notre Dame; Round 3b — Samaje Perine, RB, Oklahoma. Matt Miller of Bleacher Report (Feb. 6): Round 2 — Dan Feeney, G, Indiana; Round 3a — Antonio Garcia, T, Troy; Round 3b — Pat Elfein, C, Ohio State; Round 4a — Brian Hill, RB, Wyoming; Round 4b — Amba Etta-Tawo, WR, Syracuse; Round 5 — Justin Davis, RB, USC; Round 6 — Josh Dobbs, QB, Tennessee; Round 7 — Corey Smith, WR, Ohio State. Charlie Campbell of WalterFootball.com (Feb. 6): Round 2 — D’Onta Freeman, RB, Texas; Round 3a — Dan Feeney, G, Indiana; Round 3b — Montravius Adams. DT, Auburn. Connor Riley of SECCountry.com (Feb. 5): Roderick Johnson, OT, Florida State. Max Himelstein of NFL Draft Blitz (Feb. 4): Caleb Brantley, DT, Florida. Drafttek (Feb. 2): Round 2 — Jared Davis, OLB, Florida; Round 3a — Montravius Adums, DT, Auburn; Round 3b — Eric Magnuson, OT, Michigan; Round 4a — Tyler Orlosky, C, West Virginia; Round 4b — Kevin King, CB, Washington; Round 5 — Obi Melifonu, S, UConn; Round 6 — Jordan Morgan, G, Kutztown; Round 7 — Jamaal Williams, RB, BYU. Eddie Brown of the San Diego Union-Tribune (Feb. 1): Round 2 — Chris Wormley, DT, Michigan. “The Vikings need to add depth to their defensive line. Wormley is versatile enough to lineup inside or outside.”; Round 3a — Eric Magnuson, OT, Michigan; Round 3b — D’Onta Foreman, RB, Texas. DJ Boyer of DraftSite.com (Jan. 26): Round 1 –D’Onta Foreman, RB, Texas; Round 3a — Taylor Moton, OT, Western Michigan; Round 3b — Eddie Vanderdoes, DT, UCLA; Round 4a– Dan Skipper, OT, Arkansas; Round 4b — Cole Hikutini, TE, Louisville; Round 5 — J.J. Dielman, OT, Utah; Round 6 — Ryan Glasgow, DT, Michigan; Round 7 — Jake Eldrenkamp, OG, Washington.